Crunchy maple walnut topping on creamy pumpkin filling. “The gift that keeps on giving.” That’s what I’m going to call sugar pumpkins from now on. I purchased one before Thanksgiving for (I believe) 99¢ at Wiles Farm Market in Wileville (just outside Bridgewater). I wanted to make a pumpkin cheesecake for the family feast. I was being frugal. A can of pumpkin costs about $3.00. I discovered my recipe only took 1/4 of it. The crust ready to be filled. From the leftover part I made a pumpkin orange cake. Another 1/4 of the pumpkin used. Two desserts and only half the thing gone – and the one I bought wasn’t big, maybe 8" across. It was really starting to overstay its welcome in my crisper. So this day I decided to shoot the works and cook all of what was left, and then find a dessert that would fit what I had. What I had was 1-1/2 cups of pumpkin purée. Cakes, muffins, cookies, flans and pretty much anything that wasn’t a pumpkin pie were out. I would still have leftovers. 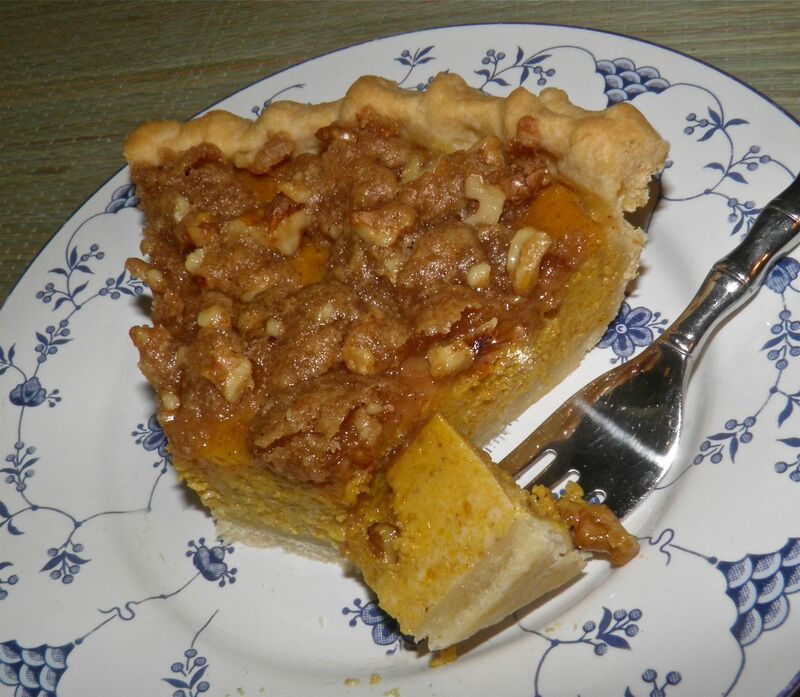 But pie – although delicious – can be a bit uninspired when you’re starting to get sick of pumpkin. 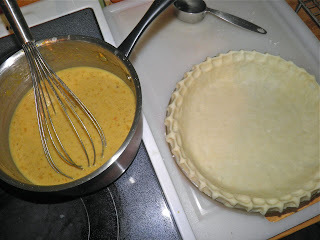 I wanted a pie with a twist, and I found that twist in a few recipes i discovered that called for sweetened condensed milk in the filling. I had never heard of that before. I had also purchased, at disgustingly high cost, some maple syrup last week. I really should tap trees come spring. Maybe a maple flavoured streusel topping would be a better fit. I could throw some maple syrup into the pie filling for good measure too. That would help knit it all together. 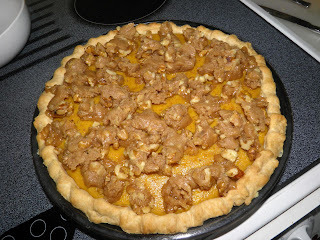 The result of my twisted thought process is the recipe I am posting today. A little of this, a little of that, and a lot of what I already had in my pantry. 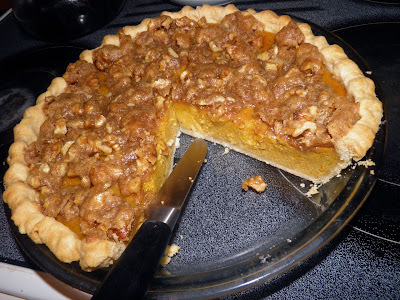 The filling tastes like a delicious cross between pumpkin pie and custard, but far more on the pie filling side than custard. The maple walnut streusel is crunchy and easy to cut – a nice counter to the soft filling in the flaky crust. 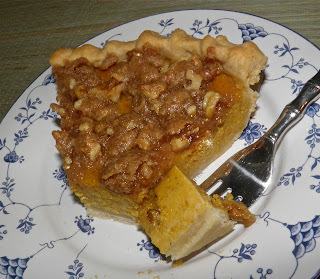 If you seem to have way too much pumpkin hanging around your kitchen, or are afraid you will after Halloween, you may want to give this recipe a try. It may not be a traditional pumpkin pie, but it may become a tradition in your family! The streusel will spread slightly in the oven. Make the crust by mixing the flour, salt and baking powder together in a bowl. Add the shortening and cut it in to the size of small peas. Then add the water and mix with a fork. Start with 4 tablespoons. Use the last tablespoon only if you need it to bring the dough together. Wrap and refrigerate while you make the filling. Preheat oven to 425°F. Whisk the pumpkin, sweetened condensed milk, eggs, maple syrup, cinnamon, ginger, nutmeg and salt in bowl until smooth. Roll the crust out and fit it into a 9” pie plate. Flute the edge whatever way you desire. Pour the filling into crust. Bake for 15 minutes at 425°F. After the first 15 minutes, reduce the heat to 350°F and baking for an additional 35 to 40 minutes. You can tell if the filling is done by inserting a knife partway into the pie (not close to the crust, not dead in the centre). If it comes out clean it’s ready for the streusel. Mix the streusel ingredients together while the pie bakes. Crumble evenly over the surface of the pie and return it to the oven for 15 more minutes. This looks perfect :) I'm all about the streusel.